The Countax Powered Scarifier is powered directly by the engine of the tractor and is fitted in place of the powered grass collector. 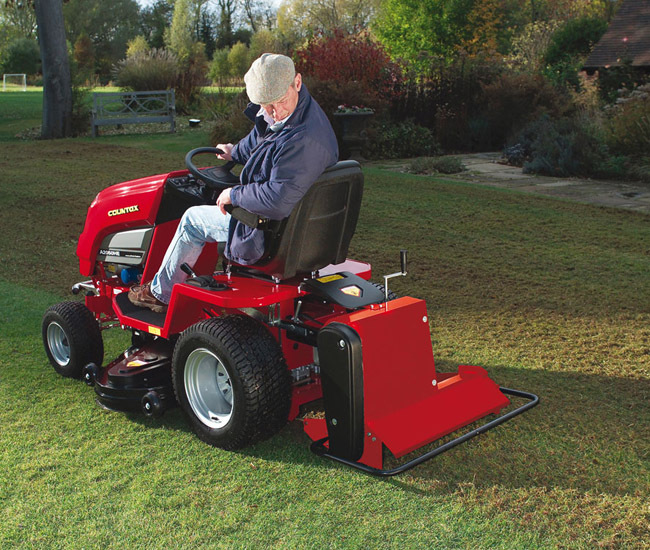 Its spinning tines remove thatch and moss allowing the grass plants to recover and improving the overall condition of the lawn. The working height of the scarifier is fully adjustable and with a 76cm/30 inches working width, a lawn can be scarified almost as quickly as it would be mowed. The powered grass collector can be used to sweep up waste material. Please contact us details of pricing of this item on 01603 738635 or 01362 699888. For customers residing in Norfolk and the Waveney Valley area of Suffolk, we offer Countax scarifiers for hire. Please see the enty in the hire section for further information.